Meaning: Hwa-Rang is named after the Hwa-Rang youth group, which originated in the Silla Dynasty in the early 7th century. 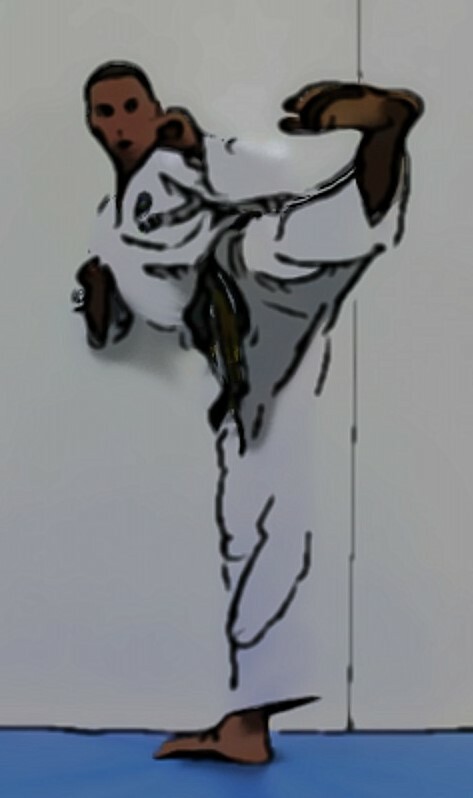 The 29 movements refer to the 29th Infantry Division, where Taekwon-Do developed into maturity. Learn your pattern with Master Symonds. 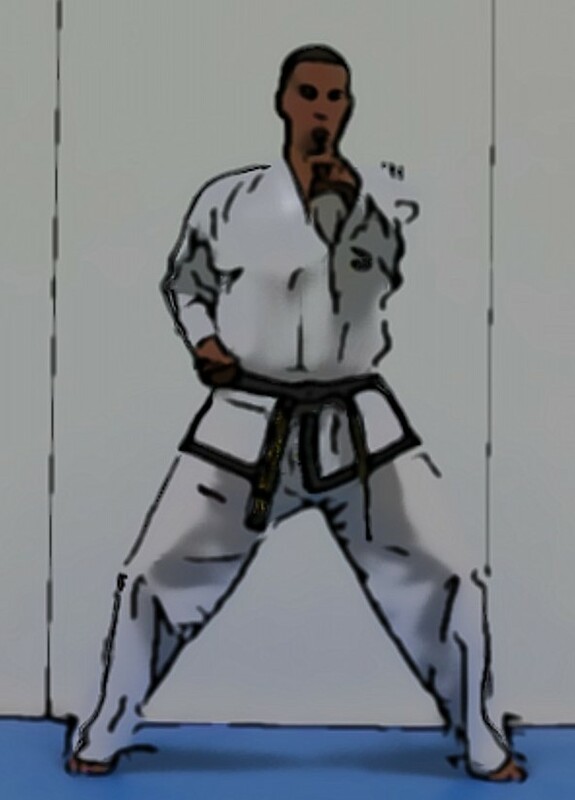 Move the left foot to B to form a sitting stance toward D while executing a middle pushing block to D with the left palm. 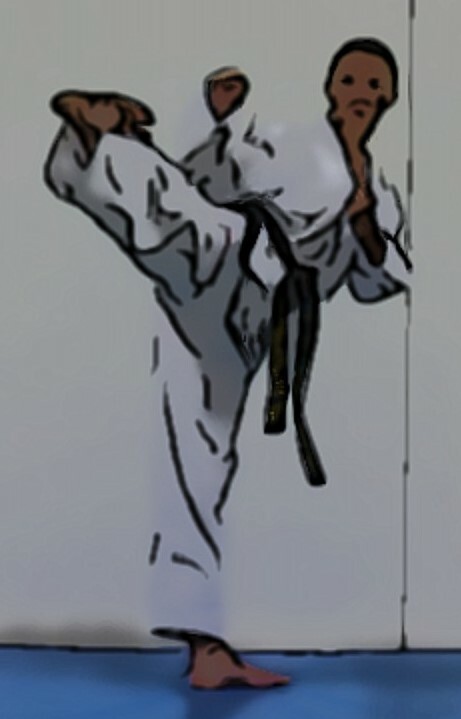 Execute a middle punch to D with the right fist while maintaining a sitting stance toward D.
Execute a middle punch to D with the left fist while maintaining a sitting stance toward D.
Execute a twin forearm block while forming a left L-stance toward A, pivoting with the left foot. 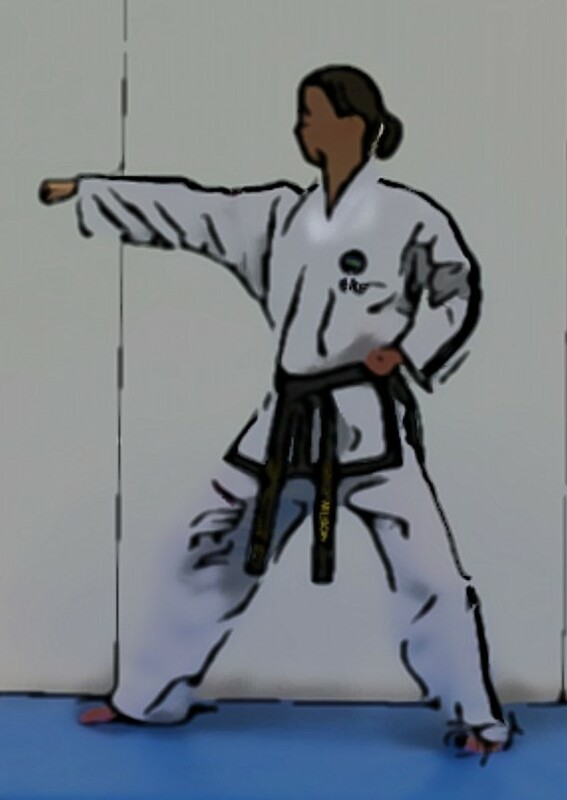 Execute an upward punch with the left fist while pulling the right side fist in front of the left shoulder, maintaining a left L-stance toward A. 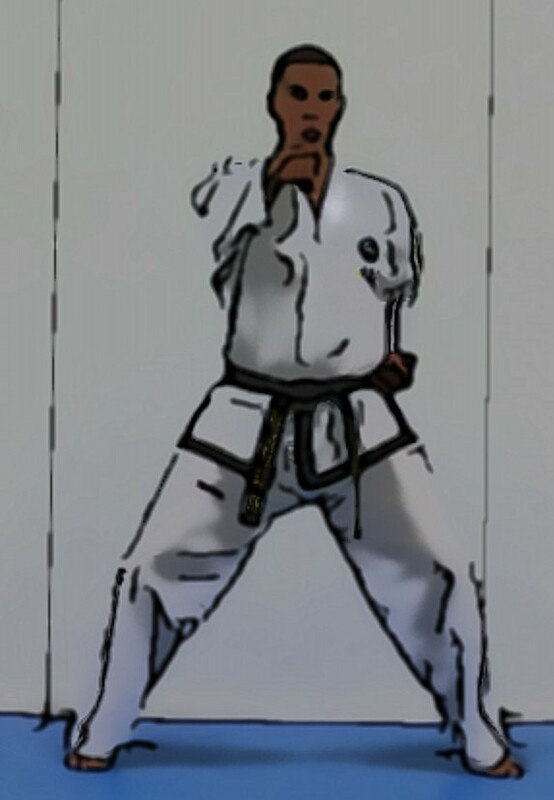 Execute a middle punch to A with the right fist while forming a right fixed stance toward A in a sliding motion. 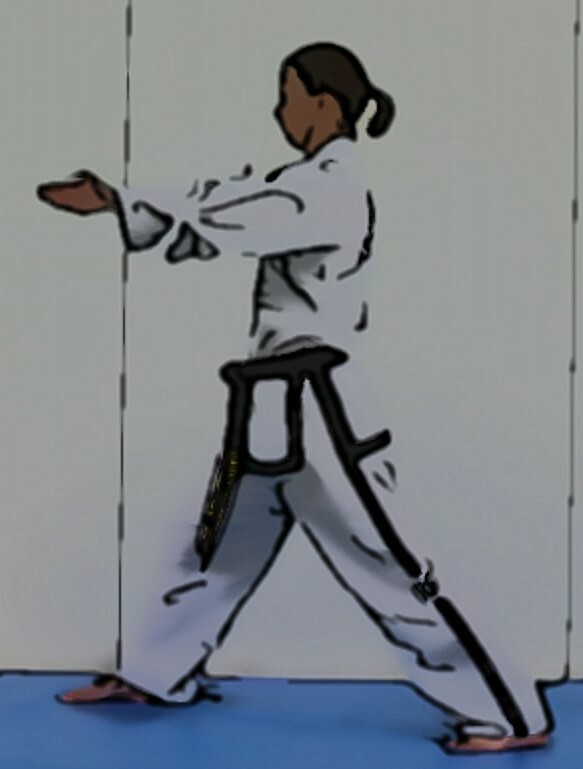 Execute a downward strike with the right knife-hand while forming a left vertical stance toward A, pulling the right foot. 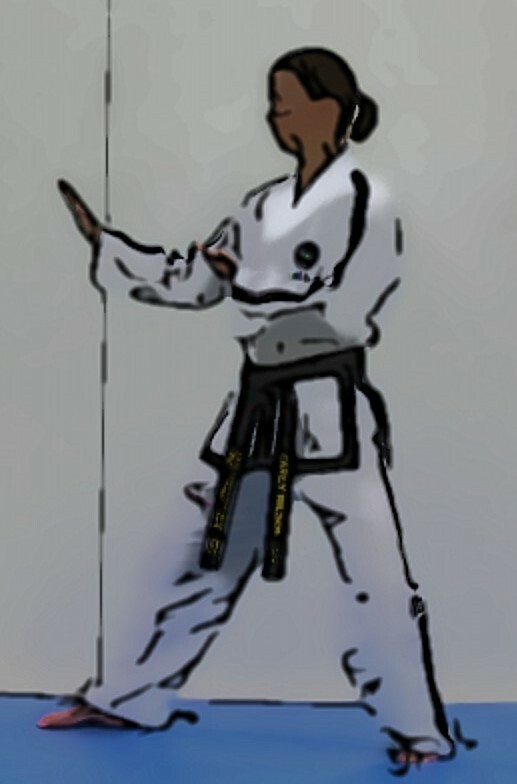 Move the left foot to A forming a left walking stance toward A while executing a middle punch to A with the left fist. Pull The Left Foot Toward The Right Foot While Bringing The Left Palm To The Right Forefist, At The Same Time Bending The Right Elbow About 45 Degrees Outward. Stance: Pull The Left Foot Toward The Right Foot While Bringing The Left Palm To The Right Forefist, At The Same Time Bending The Right Elbow About 45 Degrees Outward. 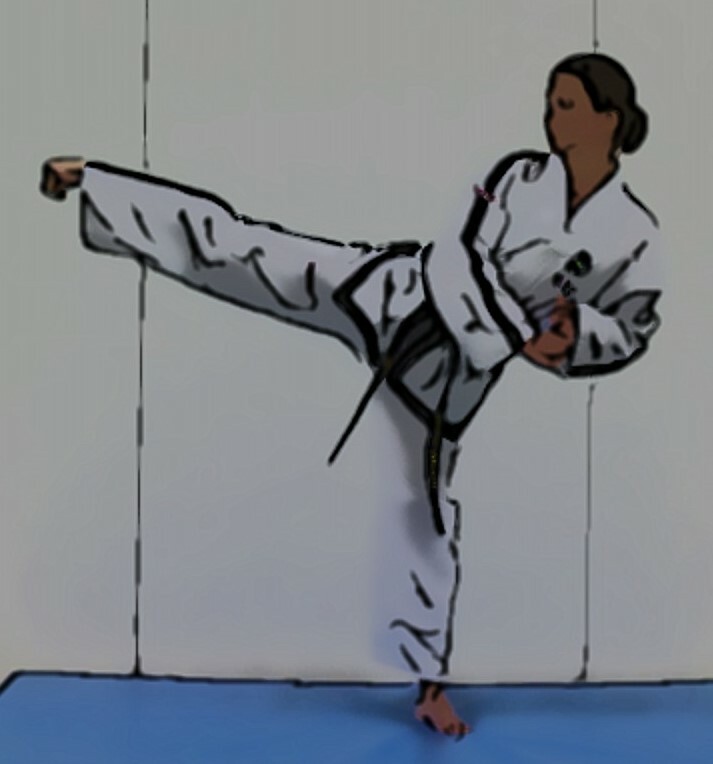 Execute a middle side piercing kick to D with the right foot while pulling both hands in the opposite direction and then lower it to D forming a left L-stance toward D, at the same time executing a middle outward strike to D with the right knife-hand. 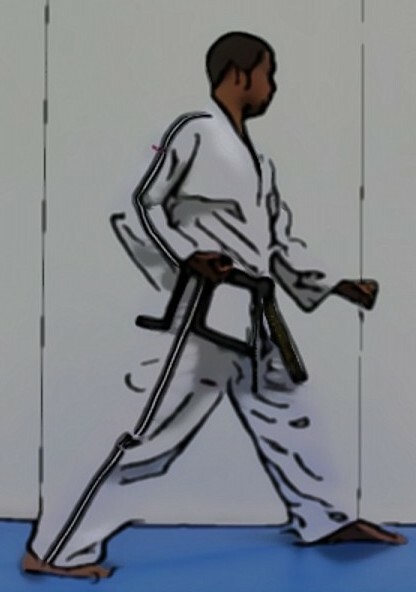 Move the left foot to D forming a left walking stance toward D while executing a middle punch to D with the left fist. 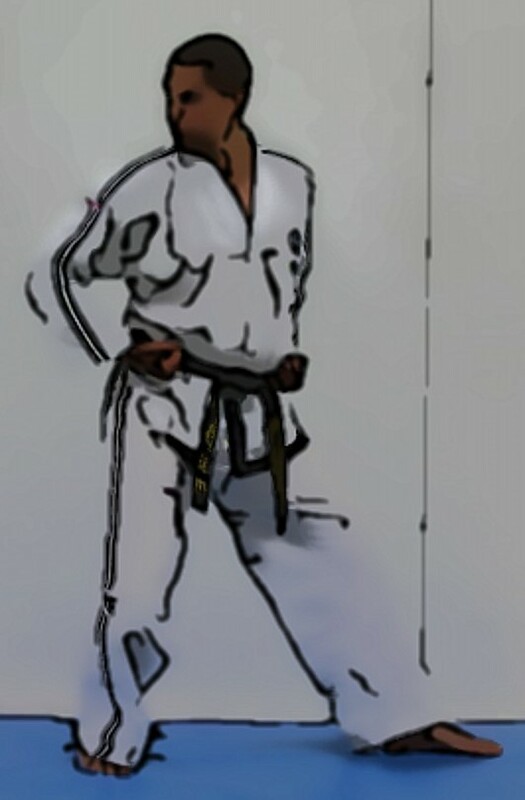 Move the right foot to D forming a right walking stance toward D at the same time executing a middle punch to D with the right fist. Move the left foot to E turning counter clockwise to form a right L-stance toward E while executing a middle guarding block to E with a knife-hand. 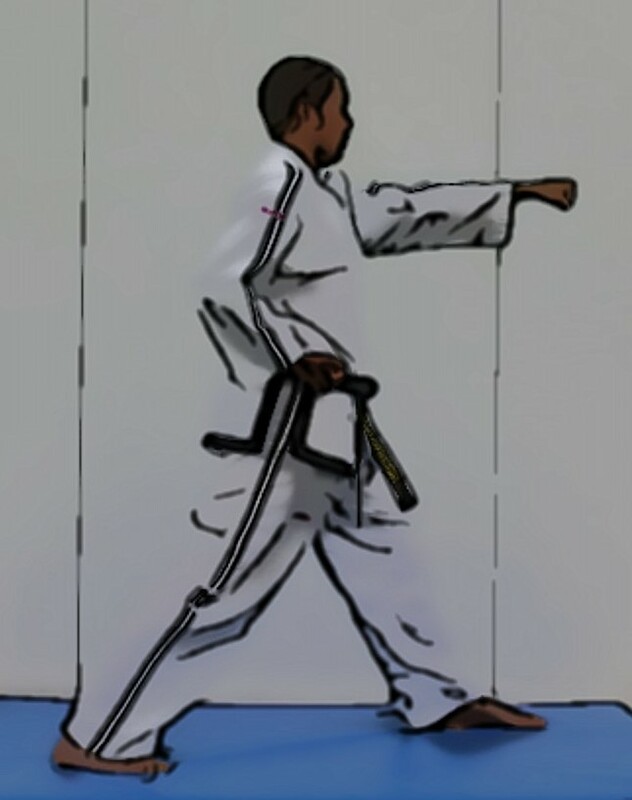 Move the right foot to E forming a right walking stance toward E while executing a middle thrust to E with the right straight finger tip. 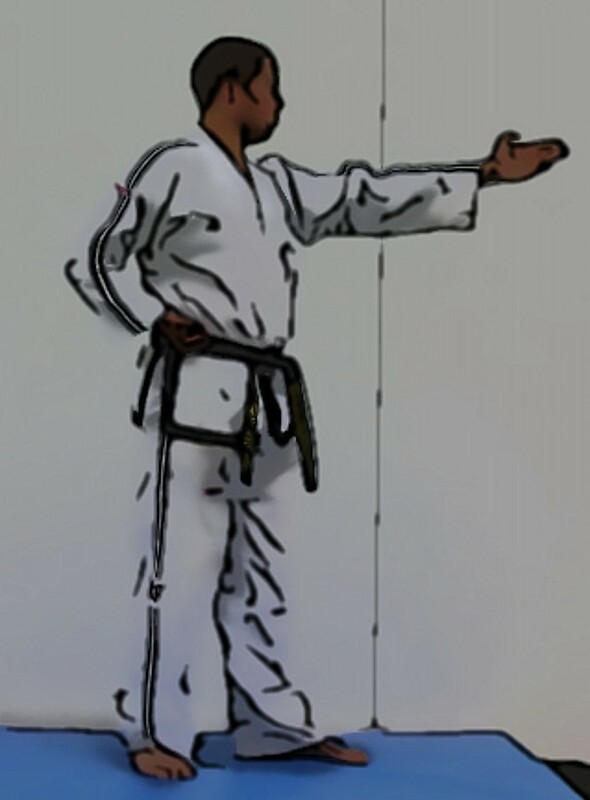 Move the right foot on line EF forming a right L-stance toward F while executing a middle guarding block to F with a knife-hand. 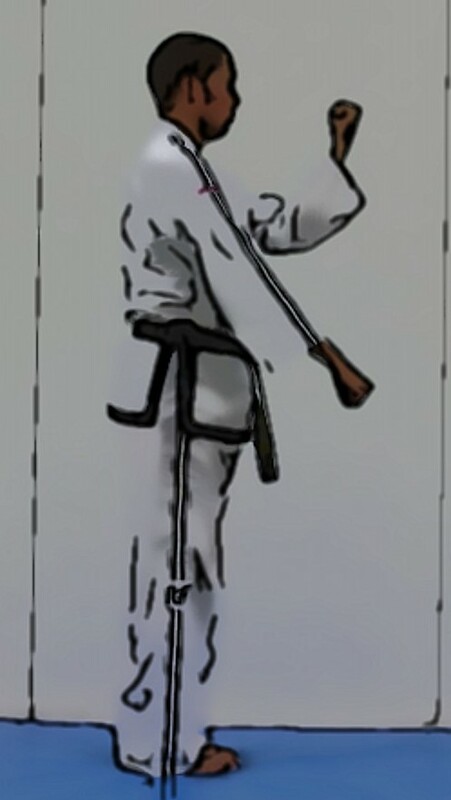 Execute a high turning kick to DF with the right foot and then lower it to F.
Execute a high turning kick to CF with the left foot and then lower it to F forming a right L-stance toward F while executing a middle guarding block to F with a knife-hand. Perform 18 and 19 in a fast motion. 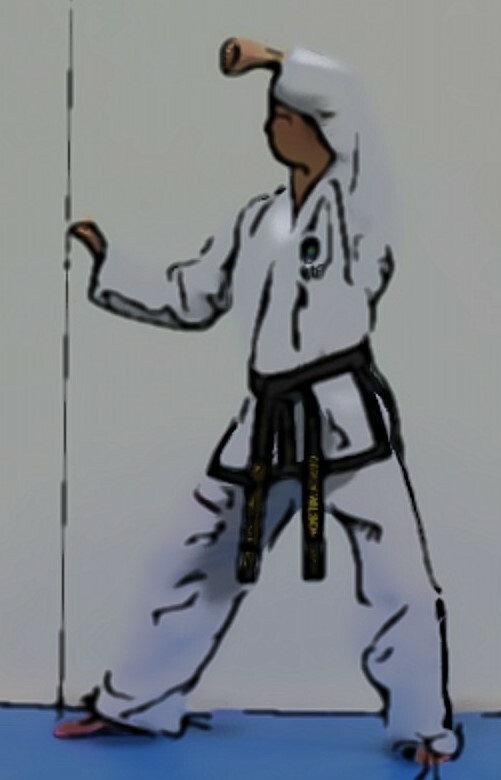 Execute a middle punch to C with the right fist while forming a right L-stance toward C, pulling the left foot. 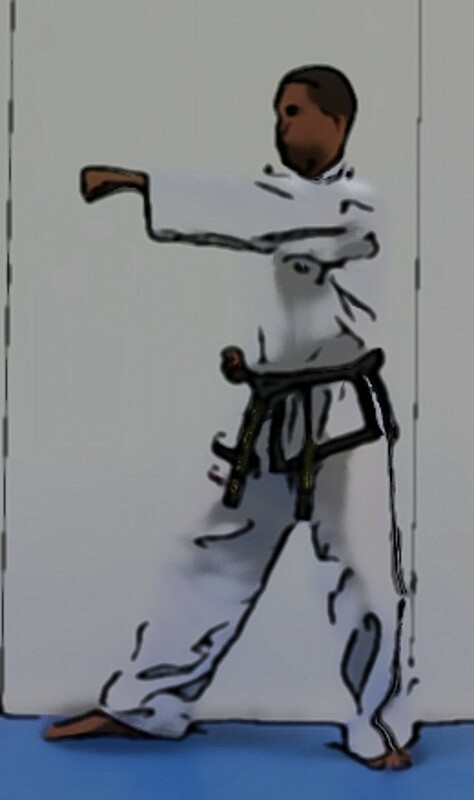 Move the right foot to C forming a left L-stance toward C while executing a middle punch to C with the left fist. 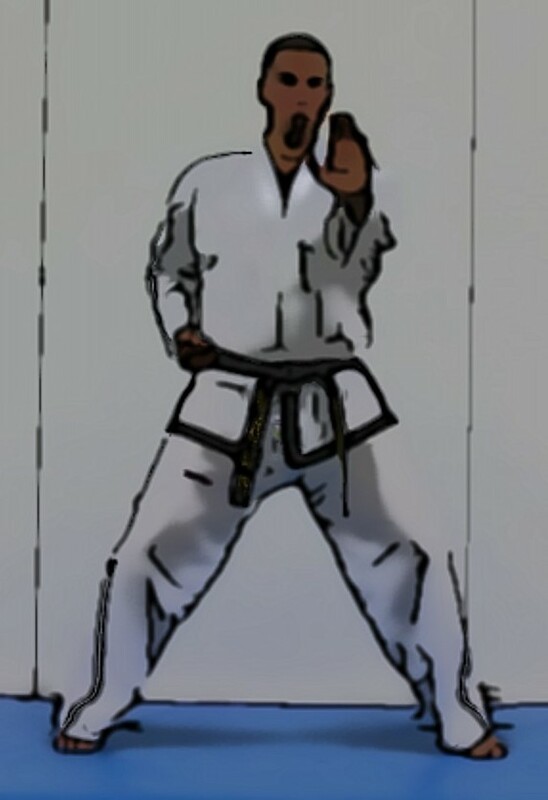 Move the left foot to C forming a right L-stance toward C while executing a middle punch to C with the right fist. 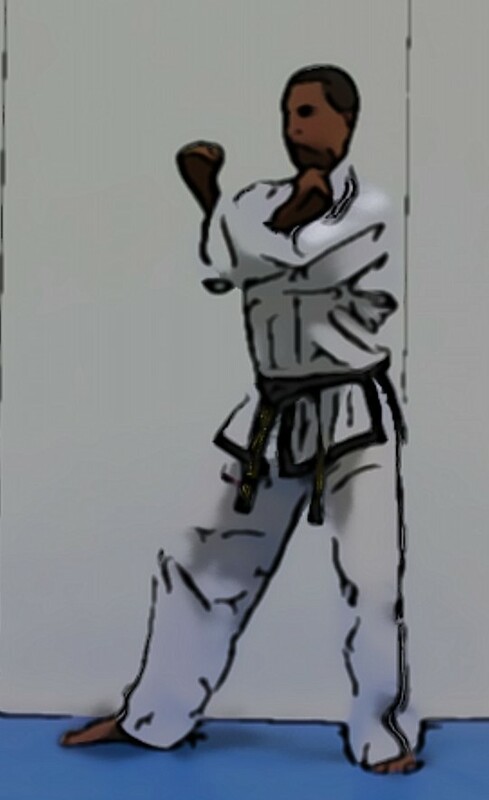 Execute a pressing block with an X-fist while forming a left walking stance toward C, slipping the left foot to C.
Move the right foot to C in a sliding motion forming a right L-stance toward D while thrusting to C with the right side elbow. 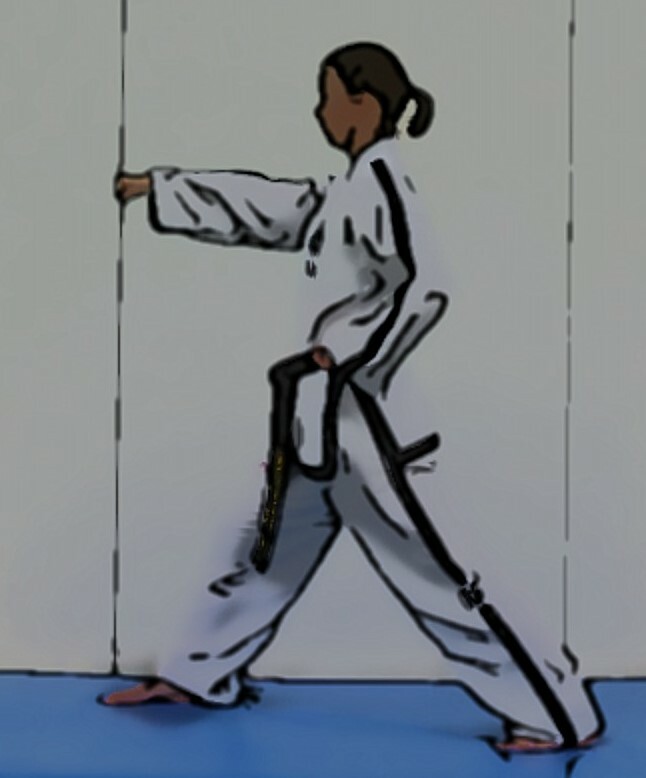 Bring the left foot to the right foot, turning counter clockwise to form a closed stance toward B while executing a side front block with the right inner forearm while extending the left forearm to the side downward. 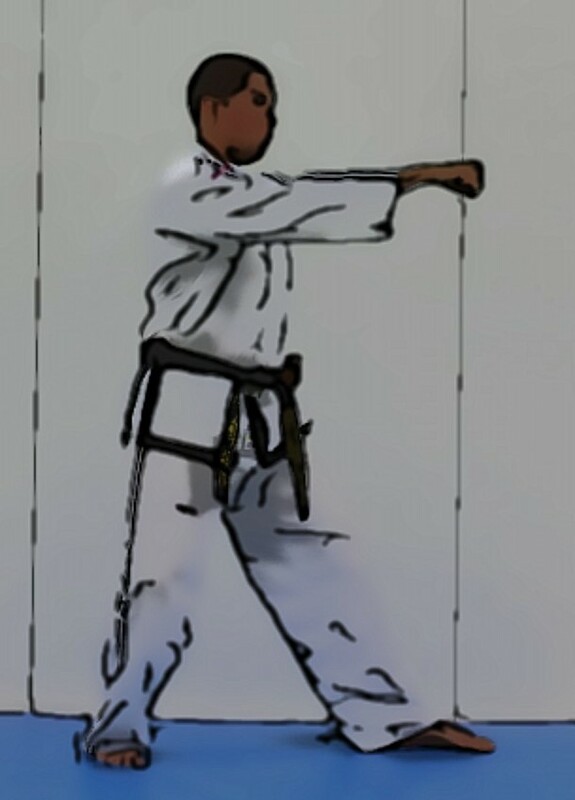 Execute a side front block with the left inner forearm, extending the right forearm to the side downward while maintaining a closed stance toward B. 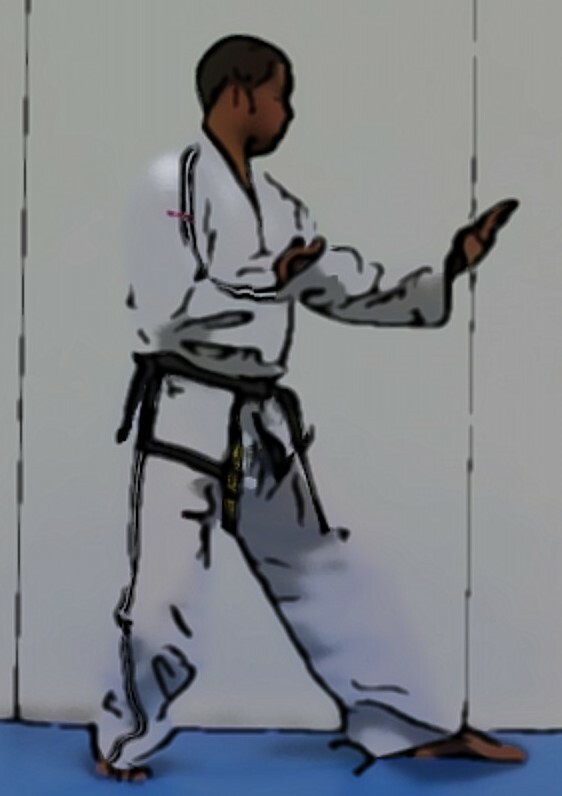 Move the left foot to B forming a right L-stance toward B at the same time executing a middle guarding block to B with a knife-hand. Bring the left foot to the right foot and then move the right foot to A forming a left L-stance toward A while executing a middle guarding block to A with a knife-hand.